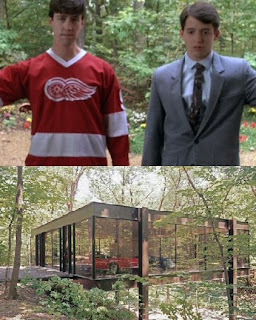 HIGHLAND PARK, IL - (The Comedy News) Two huge fans of John Hughes' teen classic Ferris Bueller's Day Off spent an afternoon discussing how awesome it would be to start a Ferris Bueller Museum. Jonathan and Jacob Rabin, 21 and 25 respectively, considered using their parents' money to purchase the house that was used as Cameron Frye's home in 1986 film. The $1.63 million dollar house on 370 Beach Street in Highland Park, Illinois would be the site of making their dream a reality. The 58-year-old home, officially known as the "Ben Rose Home", would be stripped of its four bedrooms and 4 bathrooms converted into the Ferris Bueller Museum. It has been on the selling blocks for over a year now. Attractions that would be included are the various outfits that Ferris wore throughout the film, a wax model of Matthew Broderick in a towel and wearing a towel wrapped on his head, and the #9 Detroit Red Wings Gordie Howe jersey Allan Ruck wore for the duration of the film. Also included in the museum's collection would be the blue, torn, bloody and muddy suit that was worn by Jeffrey Jones' character, the bumbling Principal Edward Rooney. It is very likely that the original Ferrari that crashed through the glass garage at the end of the film (spoiler alert) is missing. However, two replicas can be built --- one Ferrari in the garage, and the other in the impact area of the ravine that it fell into. There could also be interactive activities for children such as a 'Freak Out Like Cameron' video booth, and a 'Shake It Up Baby' and 'Danke Schoen' karaoke and parade set. The would-be founders also thought of a suggestion wall for what people think happened to Abe Froman's party when they arrived Restaurante Chez Luis--- after Ferris and friends conspired to take his reservation. "The museum would be just like Cameron's house was in the film. Very cold and very beautiful. And you won't be allowed to touch anything," Jonathan Rabin wishfully dreamed. The museum would open on the 25th anniversary of the film's release-- June 11th, 2011 with Matthew Broderick, his wife Sarah Jessica Parker Broderick, Allen Ruck, Ben Stein, and Mia Sara in attendance. The museum's founders would encourage high school students to skip a day of school to enjoy the Ferris Bueller Museum. There would also be coupons available for students who skip school to go to the museum nine times or more.